Log Cabin quilt patterns are sometimes constructed using foundation piecing techniques, especially for small quilt blocks, because the end result is perfect blocks every time, no matter how tiny their patches might be. But not everyone is a fan of foundation piecing, and foundation piecing certainly isn't the only method that can be used to sew log cabin quilts. Log Cabin quilt blocks are designed with a central patch that's surrounded by more fabric sewn in rows that radiate outward to surround the center in a circular-like motion. That first patch is most often a square and can be any size. The pieces surrounding the square can be sewn to it in different ways. In what we think of as a traditional log cabin quilt, bars are added around the center, building on each layer and ending when the square is in the middle of the block. 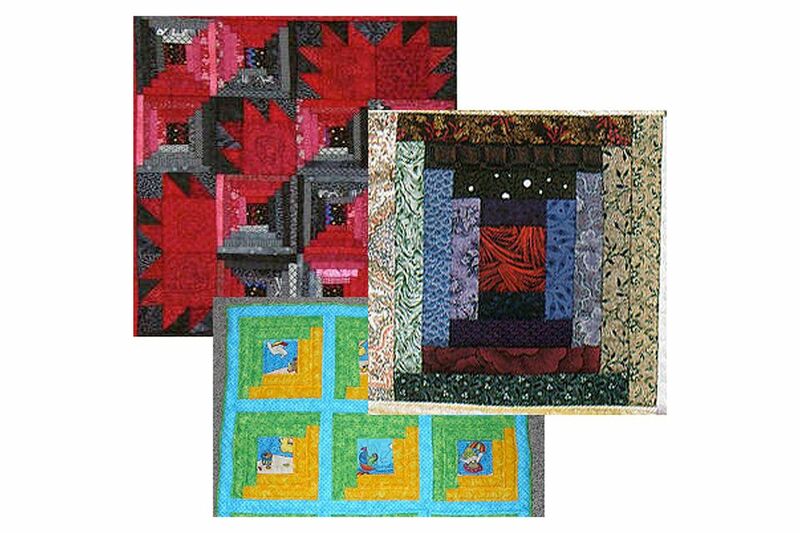 The log cabin quilt blocks used in a portion of the red and black quilt in the photo, by Dee in Tex, are examples of traditionally designed blocks. In the Courthouse Steps variation of a log cabin block, the first two pieces of patchwork are added to opposite sides of the beginning square, and the next two are sewn to the remaining two sides. That same opposite-side motion continues until the quilt block reaches the desired size. The central image illustrated is a Courthouse Steps block from Pitchers for Tildy's Cabin. If you like the variation, try the template-free Courthouse Steps quilt block pattern. The blue, gold and green log cabin quilt by Pamela Martin uses large center squares to showcase fussy-cut images of a focal print fabric. Some log cabin quilt blocks are made by positioning the square intentionally off-center, a technique that's managed by sewing more patchwork bars to one side of the square than to the other, or by using narrower strips of fabric in some areas. The center patch needn't be a square -- a rectangle can be used to create a unique look. One aspect of log cabin quilt blocks is the norm -- strips are typically sewn so that the division of sides is apparent. Contrast is often apparent along the center diagonal or from top to bottom and side to side. Tone on tone fabrics and mottled fabrics, including batiks, are a good choice for at least a portion of a log cabin quilt. The subtle prints offer visual texture and movement but are 'solid' enough to create strong definition lines between the patchwork shapes. You'll find many variations of the versatile log cabin block when you look at photos in books, magazines and online. Browse log cabin design ideas in the quilts on display in the log cabin quilt photo gallery. Take a look at those quilts before you choose a pattern. Once you have a layout in mind choose fabrics for your quilt and begin to sew.